Jhumkas are one of the traditional accessories that give trendy as well as the antique look and harmonize with every occasion. These are the exotic and striking variously sized chandelier earrings have a conical dome or circular shape. These jhumka earrings have intricate ageless designs, patterns, and motifs. Jhumka earrings give a unique and a stunning appearance that the usual pair of earrings. It is considered as the first choice in the collection list of girls and women, and thus, it has been in vogue for many years. Jhumka has its particular significance as Indian jewellery trousseau is meaningless without it. Silver jhumka and gold jhumka earrings are the most preferred earrings that women, especially in the villages, wear on their daily basis. 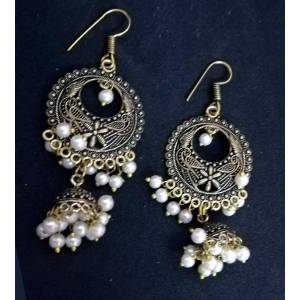 Gold jhumka earrings and silver jhumka are most preferred jhumka earrings that women wear traditionally. But, it is modernized with various colour bread. Jhumka earrings are the central part of accessories during Bharathanatyam just because of its traditional shape. 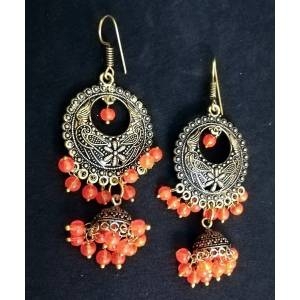 The choice for the jhumka among women is just because of the jingle of the hanging elements and its fascinating design. There are lots of beautiful designs of gold earrings pattern that delivers you trendy look and matches with your dress. But, in case if you are a jhumka lover, you should have the right sense to select a perfect jhumka that fits with occasion and clothing as well. Basically, massive or metallic jhumka like silver jhumka, gold jhumka, etc. looks great with your heavy dress like Lehengas, Anarkali suit, or heavy Designer Sarees. You can go for simple jhumka design with some appliques and arts for your simple office party, birthday party or a simple function. For the night functions, you should wear beautiful designs of gold jhumkas with lots of bling. Besides the dress matching, you also have to take care of your facial shape or structure before wearing a jhumka design. Picking right jhumka earrings that suits your face shape play a significant role that perks up your outfit and make you ready and confident for the occasion. With the thick cheeks and bigger size of the face, you can wear heavy jhumka that suits you to a great extent. You should always go for jhumka earrings if you have an oval shaped facial structure. Jhumka is considered as one of the most classic earrings that emerged in the ancient times. 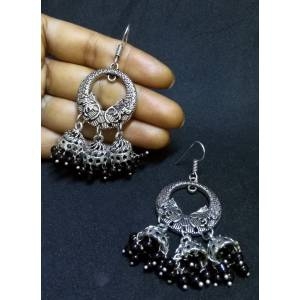 In this going time, every woman asks for various types of jhumka earrings to look appealing in a party, function, or any other special occasion. jhumka earrings designs play a significant role in completing your ethnic outfits efficiently that enhance your femininity as well. This ear ornament, jhumka gradually entered into almost every culture and tradition as well just because of unique and beautiful jhumka designs. Jhumka was also known as an essential part of the temple jewellery set before. All the bridal trousseau asks for jhumka to complete their jewellery set. But now, it is worn as a single pair of earrings without proper jewellery set. Even girls also prefer the antique piece of jhumka earrings that all are inspired by Bollywood actress because they wear big guild jhumka in their special events. 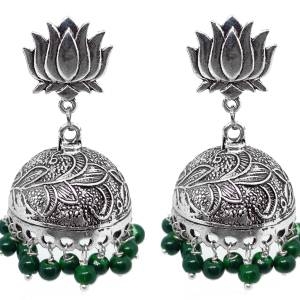 When you look for latest jhumka designs online, you are always afraid of the quality. Because it sometimes happens that you are deceived with products with expensive rates especially while shopping online. You feel it risky to purchase such a precious ornament like gold jhumka earrings or silver jhumkas. You often pay for the items that never come to you. Even online sellers purchase fake online reviews that may confuse you and make you buy something high for the cost. Thus, you should go through the website thoroughly first and then take a further step. 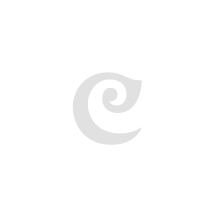 Craftsvilla is a reliable shopping station that stole the hearts of countless people since time immemorial. Craftsvilla offers you fascinating assortment of alluring gold earring jhumka designs. It makes you experience something and your jhumka earrings online shopping entirely worthy. Craftsvilla welcomes you to explore a wide variety of designs and styles of jhumka earrings. You are embellished here by the gold jhumka designs and silver jhumkas along with the Kundan work, shimmering pearls, beads, and colorful stones. Here, you find every single piece of gold jhumka earrings that are designed under art and crafted with paramount rigor. We provide jhumka that suits with your every ethnic wear such as patialas, saree, lehenga, anarkali suits, etc. We have the quality jhumka showcase that is renowned for jewellery brands have popular name and fame. Craftsvilla professes all the ornate designs of jhumka that makes you look point of eyesight. You can buy oxidized jhumka here that you can wear on your daily basis to increase your look subtly. Here, you find your perfect match as we provide the variety that leaves you spoilt definitely for a while when choosing a jhumka earring design. Craftsvilla will insist you to vividly dreaming about buying a latest jhumka design again and again. We proffer our product in a pocket-friendly manner when it comes to the latest fashion of jhumka earring shopping online. You always find here unique and high-quality merchandise that fulfills your wish to wear such a beautiful designs of gold jhumka. We asked our customers to buy ornaments like jhumka designs during our peak shopping season during the sales and the festivals where you can make you enjoy the exciting discounts or a variety of offers to a great extent. 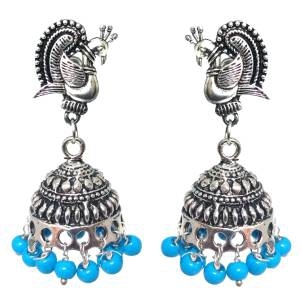 If you experience our service and quality at least once, you will wish to go ahead frequently and buy some more pieces of jhumka online for you and your loved ones to make them feel astonishing. It is the largest online fashion store that makes you drop inside, provide sound quality and welcomes you again and again.